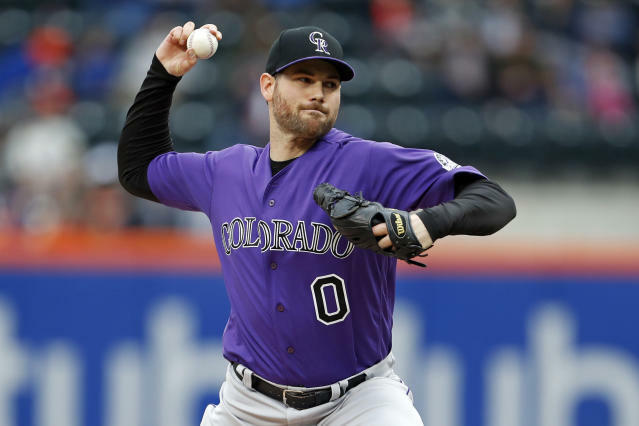 NEW YORK (AP) — On his first full day with the New York Yankees, Adam Ottavino tried to explain his Insultin' of Swat. While a free agent last month, the 33-year-old reliever disparaged Babe Ruth, the Yankees' beloved Sultan of Swat, who helped New York win four World Series titles and seven AL pennants from 1920-34 while transforming the sport with home runs. "I had an argument with a coach in Triple-A about Babe Ruth's effectiveness in today's game," Ottavino told MLB.com's Statcast podcast. "And this was like 10 years ago. I said, look, Babe Ruth, with that swing, swinging that bat, I got him hitting a buck-40 with eight homers." "And he's like, 'Are you nuts? Babe Ruth would hit .370 with 60 homers,'" Ottavino went on. "And I'm like, I would strike Babe Ruth out every time. I'm not trying to disrespect him, rest in peace, shout out to Babe Ruth. But it was a different game. I mean the guy ate hot dogs and drank beer and did whatever he did, and it was just a different game." Ottavino agreed to a $27 million, three-year contract to join Dellin Betances, Zach Britton and Chad Green as setup men for Aroldis Chapman, a deal that was finalized Thursday evening. "I was surprised that it went so viral," Ottavino said during a conference call Friday. "But I saw when they put the quote out of context out there why people would get so upset. I mean certainly I probably used a bad example of the point I was trying to make: the evolution of the pitching in baseball over baseball history. And Babe Ruth's probably a name that I shouldn't have used in this example. But I've got a lot of flak for it, mostly funny stuff, like my uncle telling me that he can't go anywhere without hearing about it. Things like that. But I meant no disrespect. I'm a huge baseball historian and love the game and it's not even something that can be proven anyway, so I find it a little funny." A Brooklyn native, Ottavino will become the first player in the history of the pinstripes to wear No. 0 — his number at Berkeley Carroll High School and for the past six seasons with the Colorado Rockies. Derek Jeter was thought to be the last player with a single-digit uniform on the Yankees, and his No. 2 was retired in 2017. New York has retired Nos. 1 (Billy Martin), 3 (Ruth), 4 (Lou Gehrig), 5 (Joe DiMaggio), 6 (Joe Torre), 7 (Mickey Mantle), 8 (Yogi Berra and Bill Dickey) and 9 (Roger Maris). He understands the number might increase already high fan expectations in the Bronx. "I could see people taking that path," he said. "But from my perspective it's the number I've had going back even before, prior to high school, and it's just something that I'm comfortable with. And realistically I understand that every type of fan recognition I get, the Yankees are going to be contingent on me pitching well. So I'm just going to try to focus on that, be myself and not try to make too big a deal about the number." Ottavino struck out a career-high 112 and walked 36 in 77 2/3 innings last year. The right-hander went 6-4 with a 2.43 ERA in 75 relief appearances. He reduced his fastball percentage, relying primarily on sliders and sinkers. He is among a trio of former Rockies to join the Yankees this offseason, following infielders Troy Tulowitzki and DJ LeMahieu. His decision to sign with a hometown team has drawn extra attention from family and friends, even people at his daughter's school. "That's something that I must talk to my family about," he said. "We understand the implications of playing here for me. We're just trying to keep the circle tight and not try to read too much of what you guys write and just focus on doing my job every day and keeping myself held to a high standard." Ottavino rented a commercial storefront in the Harlem section of Manhattan during the 2017-18 offseason for his workouts and followed with his best big league season. He cut his ERA from 5.06 to 2.43 and his WHIP from 1.63 to 0.99. He raised his strikeouts per nine innings from 10.6 to 13.0. "Basically the way that I developed my practice plan last year was very effective, and I just tried to continue what I was doing and build off of it with small changes to see if I can get a little bit more out of myself," he said. "I'm still working on a new pitch. I'm not sure if it'll be game ready or not this year, but I've been working to expand my arsenal and just trying to take a growth mindset into every day."